Have you ever missed a turn using a navigation app because you were stuck in the wrong lane? 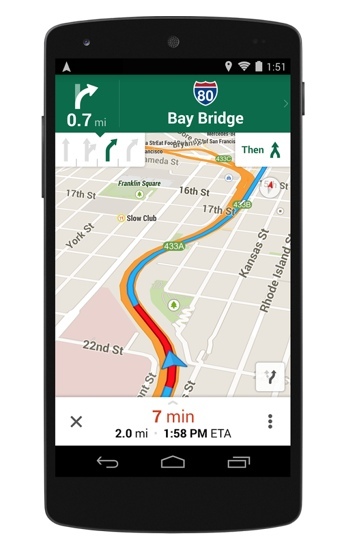 The latest build of Google Maps now contains a new feature called Lane Assist, guiding you into the right lane ahead of time to prepare you for upcoming turns and complicated Interstate exits. In areas and on multi-lane roadways where Lane Assist is available, you’ll notice small lane icons in the top left-hand corner of your Google Maps screen. The lane you want to be in to make your next turn will have a green arrow. Of course, you don’t need to stare at your phone’s screen to use Lane Assist – voice guidance and step-by-step spoken directions will keep you on course with your eyes on the road. In the U.S., Lane Assist is currently available on highways and local roads in major metropolitan areas. In Canada, Lane Assist works on highways only. You can learn more about Lane Assist and the other new features built into Google Maps by checking out the Google Maps blog. The latest build of Google Maps has a number of other new features, as well. You can now save map details for later offline use; filter local search results by price, rating and whether they’re open (a la Yelp); set a preferred mass transit departure time (including a new "last train" option) and even connect you with the Uber rideshare service if you’ve already got the Uber app installed. To use the new features in the Google Maps app, you'll need to update to the latest version, 3.0.0. If you don't have Google Maps installed on your device, you can download the free app for iOS at the Apple App Store and for Android at Google Play.